WASHINGTON — The 31st annual Army Ten-Miler road race will lead to the closure of several roads in the D.C. area Sunday. Route 110 between Rosslyn and Crystal City will be closed in both directions at 5 a.m. (Use the George Washington Memorial Parkway as an alternative). I-395 HOV northbound from Crystal City to the 14th Street Bridge will be closed at 6 a.m.
S. Eads Street from Army Navy Drive into the Pentagon/ northbound I-395 HOV lanes will be closed at 5 a.m.
I-395 southbound HOV exit to S. Eads Street / Pentagon south parking lot will be closed at 5 a.m.
Route 27 in both directions from George Washington Memorial Parkway to I-395 will be closed from 7:30 a.m. to 10 a.m.
Army Navy Drive from S. Eads Street to S. 12th Street from approximately 8 a.m. to noon. S. 12th Street from S. Eads Street to Long Bridge Drive from approximately 8 a.m. to noon. Long Bridge Drive will be closed from S. 12th Street to Boundary Channel Drive from approximately 8 a.m. to noon. All roads should be reopened by noon. Those streets will be intermittently closed along the race route beginning approximately at 6:00 a.m. and should reopen by 12:00 p.m.
Access to the north parking lot at the Pentagon will be restricted to authorized vehicles from 4:30 a.m. to 2 p.m. Pentagon employees and Pentagon Memorial patrons can park in the south parking lot via Columbia Pike and S. Fern Street. The police encourage runners, spectators and support personnel to use Metro, because of limited parking. The Pentagon and Pentagon City stations on the Blue and Yellow Lines are within walking distance of the start and finish lines, they say. While organizers of the race and other events this weekend such as the march marking the 20th anniversary of the Million Man March are encouraging participants to ride Metro, there are no Orange Line trains this weekend between East Falls Church and Vienna. Buses will run instead between East Falls Church, West Falls Church, Dunn Loring and Vienna. Silver Line trains will run between Wiehle-Reston East and New Carrollton and only Blue Line trains will run between Largo and Stadium-Armory. There will be no trains labelled as Orange Line trains this weekend, so riders attempting to get to or from Orange Line stops should take trains that are labelled as the Silver Line. Riders should get off at East Falls Church to transfer to shuttle buses to reach Vienna. Riders driving to Metro should consider driving to East Falls Church or Wiehle-Reston East rather than Vienna, Dunn Loring or West Falls Church. Metrorail will open two hours early, at 5 a.m., Oct. 11, for riders traveling to the Army Ten-Miler. The closest Metro stop to the start of the race is Pentagon on the Blue and Yellow lines. On Columbus Day, Oct. 12, Metrorail will open at 5 a.m. and close at midnight. Trains will operate at Saturday service intervals (every 6 to 12 minutes during daytime hours). Off-peak fares will be in effect all day and parking will be free at all Metrorail parking facilities. 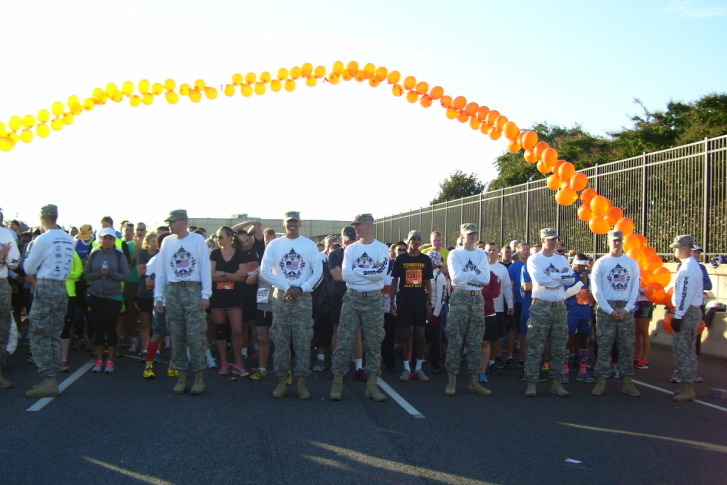 More race details can be found on the official website for the Army Ten-Miler.